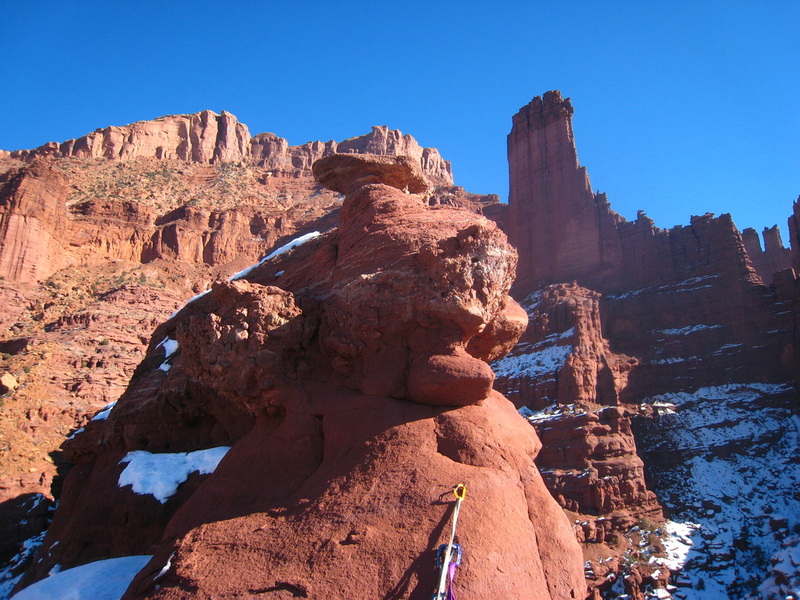 It was a cold weekend in January and Scott had contacted me about a trip to the Moab area. 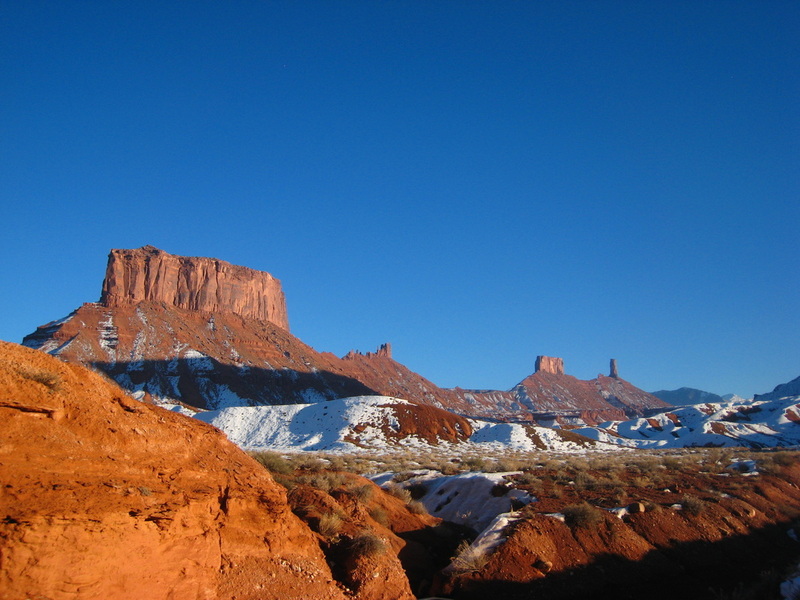 Since I had done a bit of ice climbing, I agreed and looked forward to a nice trip back to the desert. On my way over from Ouray (I was climbing at the ice park for a couple days) I picked up a vagabond in Ridgeway who was trying to get to Durango, but due to the closure of Red Mountain Pass for road work he was stuck. So I offered to give him a ride to Moab. He was happy to go and we drove to Moab. I actually also bought him dinner at Denny's and a night stay at the Lazy Lizard Hostel. The next morning I dropped him off back at the Denny's where he could try to get a ride somewhere else and I met Scott and his family at the Super 8. I carpooled with them as we drove into Arches National Park. 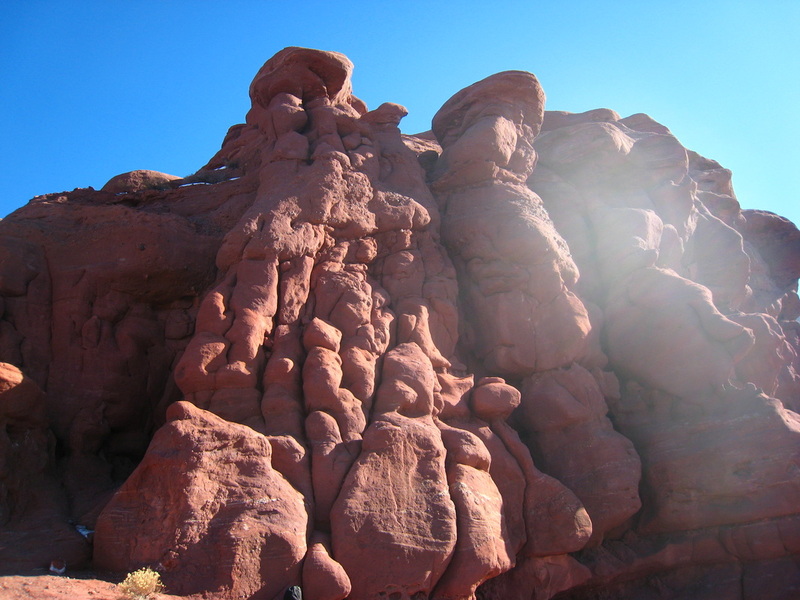 The plan for the day was to climb Elephant Butte and if time allowed, either Owl Rock or Bullwinkle Tower. We parked at the small pull-out just before The Windows area. Scott had been up many times before but not in January. We saw areas of snow in shaded areas which was sure to spice things up a bit. Scott led the way as we hiked across open desert toward the formation. We entered a wide canyon and scrambled up as it slowly narrowed. We were then forced onto a ledge on the right side which was covered in about an inch of snow and was icy! The exposure was decent too. I ended up helping Scotts' kids and his wife up this section. Once above that, it was a short drop and then some slickrock scrambling until we reached the crux of the route. A 10 foot step that would normally be 4th class but a thin sheet of ice was covering it. I led the way with a rope tied to me and climbed around the ice. I set an anchor at the top and gave everyone a belay. Amazingly, there was a large pack with a lot of excellent gear inside sitting atop this step. An $800 camera, a large guidebook and other climbing gear! We guessed someone threw it up to get the weight off but then couldn't climb up the step. We picked it up planning to return it to the rangers once we got down. We passed through a small saddle, then set the rope up through the bolts for the rappel. Yes, there was a rappel on the ascent route! It took awhile for everyone to make the rappel as it curved quite a bit to the left as we rapped. Once everyone was down though, it was an easy scramble for awhile up the slickrock slabs. We veered slightly rightward and located the 15 foot chimney to reach the summit plateau. Everyone made it up easily and we were soon on the summit overlooking hoards of tourists walking around the arches below us. 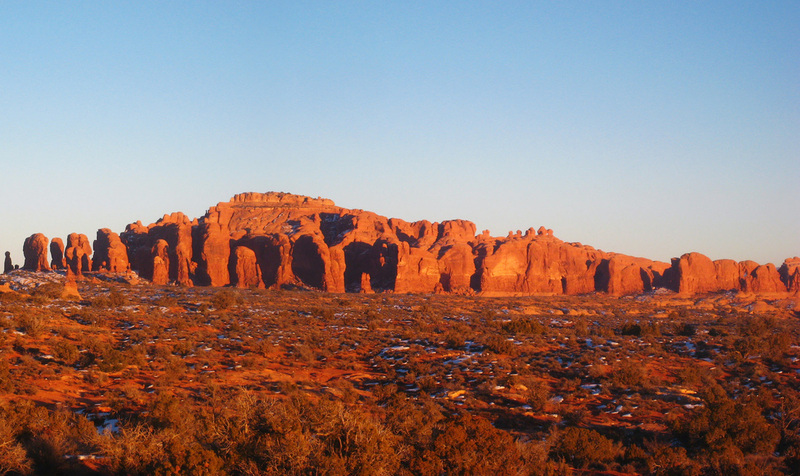 Even in January, Arches NP is crawling with tourists! 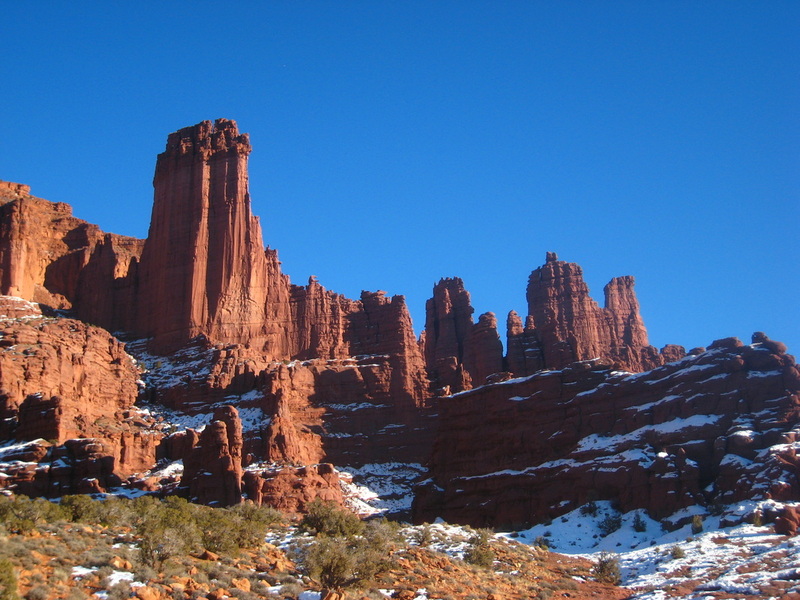 I located many familiar areas including the Fisher Towers, Delicate Arch and the Moab Valley. For the descent, we retraced our steps to the base of the ascent rappel, then continued down the obvious drainage. Scott was raving there will be a pool to wade through to reach the anchors but I figured it would be frozen. Sure enough, we walked right across on solid ice, I set the ropes and went first. There was a 10 foot long, 2 foot wide icicle hanging down as the rappel became overhanging and I had to be very careful not to break it off! If that thing broke and hit your head it would really hurt. Slowly, we all made it down and from there, it was a short walk out. Since we were hiking right past Bullwinkle Tower, and I had all the protection needed, we decided to just climb that. 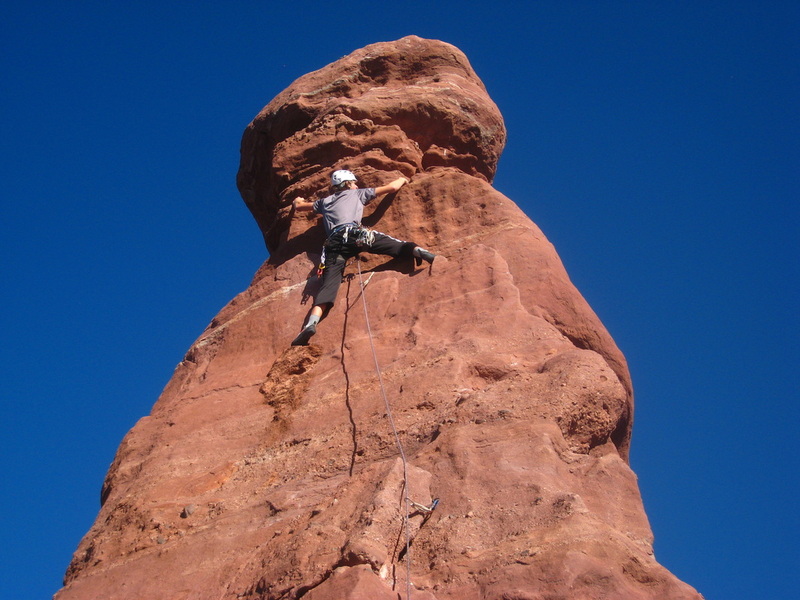 The west side has a fun chimney route that climbs about 85 feet to the small summit. The only thing I didn't have was my rock shoes but my trail runners sufficed since it was a wide chimney. I led up, cranking through the so-called crux at the bottom easily (because I am tall!). I only needed a few larger cams to protect it and reached the anchors. Scott tried next but wasn't able to finish the climb in the chimney, Kessler then game it a go and made it up pretty easily. He stood on top with me awhile while Shaylee tried. Was a fun little climb that was in the afternoon sun so it kept us warm. After finishing up, it was a 5 minute walk back to the car and off to dinner in Moab. The next morning we agreed to head to the Fishers to climb a couple of the smaller rock formations. Kessler, Scott and I all climbed Dock Rock, which was awful, then hiked over to Lizard Rock which was much more fun. Lizard Rock is a nice 5.9 route that is not really deserving of its "R" rating due to a piton found 80% of the way up. By 3pm, Scott and his family started back to Craig and I made a bee line for Eddie McStiffs to watch the Seahawks play the 49ers in the NFC Championship Game. That was easily the best football game I have ever seen! Go Hawks!